This is a list of resources specifically for HTML5. Feel free to add to it if you know other great HTML5 resources. The New Standard for HTML - The W3Schools introduction to HTML5. 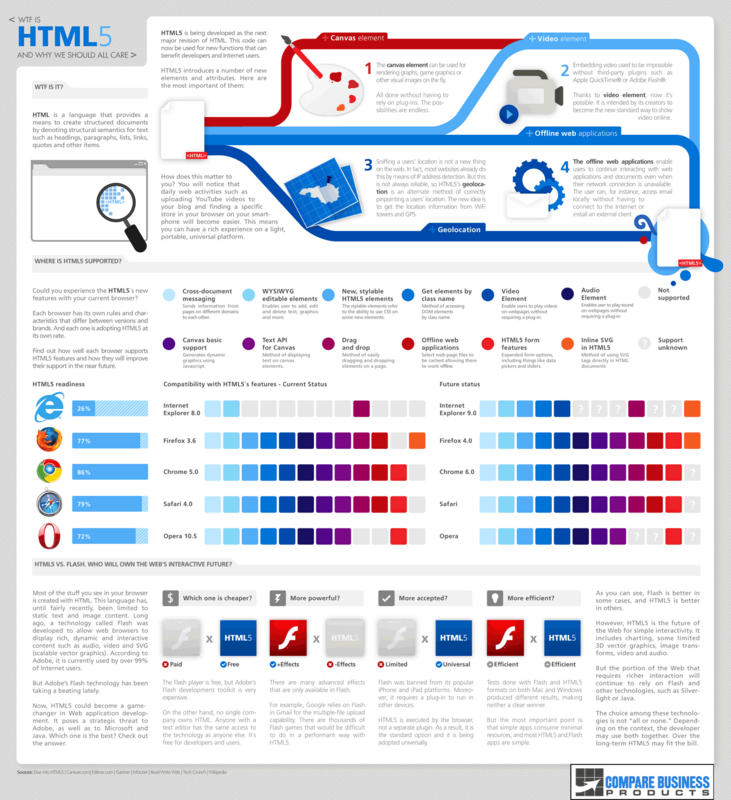 WTF is HTML5 - An infographic about HTML5. Introduction to Canvas in HTML5 - How to use the Canvas in HTML5. Canvas & Drawing in HTML5 - How to draw basic shapes on the Canvas in HTML5. Backwards Compatibility with Unsupported Browsers - A way to make outdated browsers (IE8 and below) run HTML5 code. HTML5 Demos - Many small demonstrations of HTML5. Source provided with highlighting. Score Rush - A port of an Xbox game built in HTML5. Worth a look for the stunning graphics (you'll need a decent PC and an up to date browser). HTML5 Command and Conquer - an ongoing work to port the original Command and Conquer game into HTML5. HTML5 HTML5 Presentation - A presentation about HTML5 that was made in HTML5. Video EXPLOSION - Explode a video as it's playing through HTML5. Game Development Tutorials in HTML5 - News and tutorials for HTML5 game developers. HTML5 Game Devs Tutorials - Tutorials on making games with HTML5. The Reality of HTML5 Game Development - An in-depth look at HTML5 as a gaming platform, written by PhotonStorm, a high profile casual game developer. Impact - A game engine for HTML5. License costs $99 but includes a level editor, iOS publishing tools, and debug tools. HTML5 Browser Test - Check how well your browser supports HTML5. The History of HTML5 - HTML5's history in infographic form. - A collection of basic, free HTML5 templates. HTML5 Rocks. Includes tutorials, resources, and a playground for experimenting with HTML5. This is an extremely useful compilation of resources. Thank you for the hard work!